Hurawlhi is the new luxury resort located near Kuredu in Lhaviyani Atoll. It is well known for being home to world’s largent underwater restaurant. This new luxury resort comes with 17 snorkeling points around the housereef of which 3 are for deginners, 6 for deep water snorkellers and 8 for advanced snorkeling. Let’s get straight to the map of Hurawalhi. Keep note of the strong current areas and no-snorkelling zones. There is a good size housereef that almost encirlces the entire island. So, there is plenty of space to enjoy your snorkelling without going to banned zones. Near the jetty there are boats going in and out, it is not safe to snorkel there. 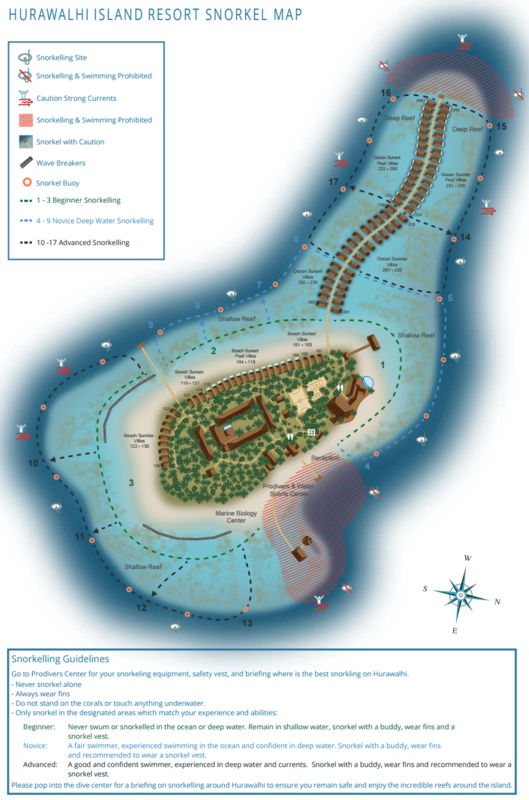 The second snorkelling-banned zone is the end of water villas. It something happens to you while snorkeling it seems to be a blind spot where no body would see you scream for help. This is not the case in other areas of the resort. There are villas or outlets from where guests or staff would most probably see if you scream for help. Remember, safety is very important, not only in Maldives but in any destination. Not only while at sea, pool safety too are imporant to keep in mind.